JNU GROUP’s JPAY Platform and Korea Smart City Institute “SMART CVC” sign Strategic Partnership Contract. JNU GROUP is also the company behind the green ICO CyClean. 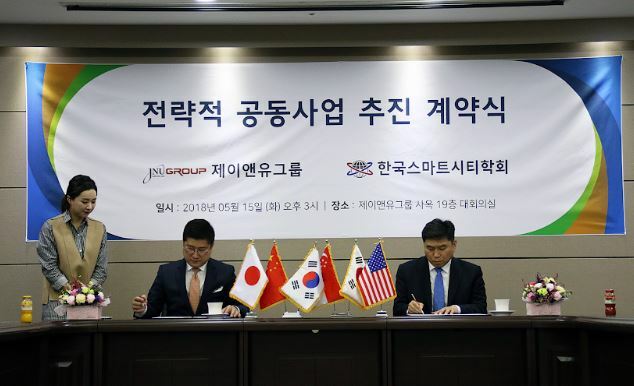 The World’s first cryptocurrency that does not trade with fiat currency, “JPAY” is opening a new era for cryptocurrency by expanding its member stores in South Korea and now signing with Korea Smart City Institute for a strategic partnership at 15th of May. Corporation Korea Smart City Institute (President Chang Hee Kwon) is an organization conjoined by research institutes, academia, and companies in order to achieve 4th revolution for the flourishment of South Korea by building sustainable and eco-friendly Green-City with Intelligent special network, Smart city related technology development and government supports, and standardization of services and interaction with related departments. With this strategic partnership, JNU group will provide core blockchain technology and platform structure for “SMART CVC(Smart City Village Campus)” business of Korea Smart City Institute, and Korea Smart City Institute will consult on JNU Group Platform’s compatibility for government’s ICT policy and work processes. The chairman of JNU Group and Founder of CyClean Platform, Dae Young Kim states “The fact that Korea Smart City Institute with active consulting on current policy making chose JNU Group over other competitive entrepreneurs for this ‘SMART CVC’ project proves that JPAY Platform and CyClean are the most advanced blockchain platform” and “that JPAY platform has secured its foothold as the first pioneer of CPG (Crypto Payment Gateway) provider”. JPAY Platform’s another axis is CyClean Platform which rewards usages of bicycle, electrical bicycle, and electrical motorbikes and that of energy source from domestic sunlight panel and magnetic field generation. CyClean platform promotes clean energy by its reward with CyClean coins and will be most effective at regions such as JEJU island where large scale public green policies are being applied. Korea Smart City Institute will utilize this partnership as the starting point to expand and export Smart Crypto Valley paradigm to not only South Korea but to other regions in the globe with the help of JNU Group.